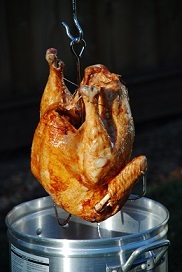 Did you know that deep frying turkey wasn’t always a poplar thing to do? Yeah – it’s an activity that only grew popular in recent times. The gist of the process involves placing your favorite turkey into roughly three gallons of frying oil. Some people like to use a fryer heated via propane while others prefer different cooking methods. You’ve probably seen some of the recent videos that illustrate the dangers of frying turkey. If you haven’t, you should give them a good watch because it’s downright scary. If you don’t do it correctly, you could be putting your home and life at risk. There is no doubt that a deep fried turkey is delicious, but the process required to cook the turkey can be extremely dangerous. Before you begin frying, you should be well-equipped with the latest safety tips. Every year, thousands of fires occur as a result of turkey frying. Even worse, a lot of people have DIED because they didn’t exercise proper safety. Before you start cooking, you should make sure the turkey is thawed and dry. In case you didn’t know, adding water to extremely hot oil is the major cause of deep frying fires. Any extra water will cause the oil to boil furiously. If the oil happens to spill over the edge of the fryer, it can hit the heat source and catch on fire. By making sure your turkey is as dry and thawed as possible, you avoid adding any unnecessary water to the oil, which can cause it to boil over and catch on fire. Whenever you’re frying a large turkey, you should always do it away from your home. Many people make the mistake of frying it on a deck or close to their home. If something goes wrong, the damage can be minimized if the turkey is far away from the home because it’s very unlikely that it will catch your entire home on fire. When you’re frying your turkey, always try to do it on level ground. You should try to keep the oil as steady and even at all times. A level surface will also help you to make sure you don’t add more oil than is needed, which will prevent the oil from spilling over and catching on fire. You should constantly monitor the temperature of the deep fryer and be careful when touching it. The handle and lid have the potential to become extremely hot, and you don’t want to get burned. You should also be using a deep fryer that has a temperature gauge because you don’t want to be frying without knowing how hot the oil is – this is a recipe for disaster. As mentioned earlier, the reason why frying turkey is so dangerous is because it requires a lot of oil, and if the oil spills over and comes into contact with an ignition source, it will catch on fire and create a massive blaze. You can get prepared by keeping a fire extinguisher on hand. The major reason why thousands of families decide to deep fry their turkey is because it’s the fastest way to cook the bird. It also produces a finished product that is, arguably, juicier and tastier than any other method of cooking. The problem is that turkey fryers can be extremely dangerous. You should always keep the fryer away from wood and other easily-combustible parts of your home. It’s also important to never operate the fryer when it’s raining outside because the water will cause the oil to flare up. Also, avoid moving the fryer once it has been set up. If using a propane fryer, make sure to keep a distance of at least two feet between the burn and propane tank. The manufacturer instructions should be followed to avoid overfilling the container. If possible, try to fry a smaller turkey. A bird that is about 8 to 10 pounds should work best. Whenever possible, try to avoid frying a turkey that is 12+ pounds. It’s also important to never leave the fryer unattended. Never heat oil beyond its smoke point. Always shut off the burner before you actually load the turkey into the fryer. Make sure your fire extinguisher is rated for grease fires.